World 4 in Yoshi's Island DS takes place in the mountains of Yoshi's Island, becoming snowier and colder in the second half as Yoshi scales greater heights. In World 4-5, Baby Bowser encounters Yoshi and his party, and decides to join them on their adventure. However, this alliance is short-lived, as at the end of the world, Baby Bowser abandons the party as he attempts to go off with Kamek. World 4, like all other worlds in the game, has a total of ten levels; six regular, two hidden, and two bosses. The bosses in this world are Six-Face Sal and Big Guy the Stilted. 4-1: Rock 'n' Fall This level takes place on the cliffs of Yoshi's Island. Yoshi needs to jump across rocks while avoiding getting crushed by ones coming from above. 4-2: High-Speed Cart Race This level takes place on a high mountain. 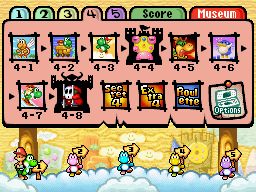 Yoshi uses a cart to progress through the level. 4-3: In the Clouds This level takes place in the skies of Yoshi's Island where Yoshi has to bounce on clouds to progress though the level. 4-4: Six Face Sal's Fort This level is inside a fortress filled with lava and Fangs, the boss of this level is Six Face Sal. 4-5: Friend or Foe? This level introduces Baby Bowser who can be used to melt ice and light up dark places. 4-6: Slip Slidin' Away This level is on a icy mountain and has a lot of Bumpties which Yoshi must avoid. 4-7: Teeth-Chattering Chill Zone This level involves using the slippery ice as an advantage and as something to beware of, the latter parts of the level introduces Ski Yoshi. 4-8: Castle of Big Guy the Stilted This level takes place in a Castle and involves using Baby Bowser as a shortcut to trigger things that normally require eggs, Big Guy the Stilted is the boss of the castle. Secret 4: Hurry and Throw! Extra 4: Let There Be Light! World 1 Ba-dum BUM! • Hit the M Blocks! • Mario's Fleet Feet • Castle of the Big Burt Bros. • Catch the Breeze • Glide Guys Take to the Skies • Baby Mario and Baby Peach: Dynamic Duo • Gilbert the Gooey's Castle • Welcome to Yoshi Tower! • Return of the Moving Chomp Rock! World 4 Rock 'n' Fall • High-Speed Cart Race • In the Clouds • Six-Face Sal's Fort • Friend or Foe? • Slip Slidin' Away • Teeth-Chattering Chill Zone • Castle of Big Guy the Stilted • Hurry and Throw! • Let There Be Light! World 5 Rompin', Stompin' Chomps • Goonie Heights • Spear Guys' Village Found! • The Fort of Moltz the Very Goonie • The Cave That Never Ends • Find the Number Ball! • Superhard Acrobatics • At Last, Bowser's Castle! • Yoshi's Island Easter Eggs • Quit it Already, Tap-Tap! This page was last edited on November 22, 2017, at 14:35.